Just hours after I posted a rumor that AMD would reveal its Radeon HD 8000M series at CES 2013, the company already released some preliminary information about these upcoming mobile GPUs! The Radeon HD 8000M series is based on the GCN (Graphics Core Next) architecture that debuted with the Radeon HD 7000 series, it offers DirectX 11.1 support and will be made using TSMC's 28nm process. AMD says the 8000M series has been tweaked for enhanced power efficiency and performance versus the previous generation. The lineup will also get an enhanced version of Enduro to increase this technology's competitiveness with NVIDIA's Optimus technology. AMD revealed that the new Enduro technology will be able to automatically select the best graphcis options based on performance or power efficiency, as well as offer an enhanced set of tweaking tools for enthusiasts. The slide below reveals that the Radeon HD 8500M, Radeon HD 8600M and Radeon HD 8700M series are all based on the same GPU with 384 shaders, with the main difference being different GPU and memory clockspeeds. All three series will be offered with both GDDR5 and DDR3 memory support. The Radeon HD 8800M on the other hand is a larger chip, it has 640 shaders and will be offered with 650-700MHz clockspeeds and GDDR5 memory clocked up to 4500MHz. 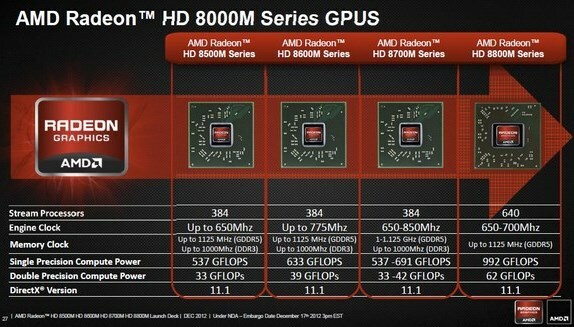 Here are some preliminary benchmarks from AMD, more details are expected to follow in Q1 2013. 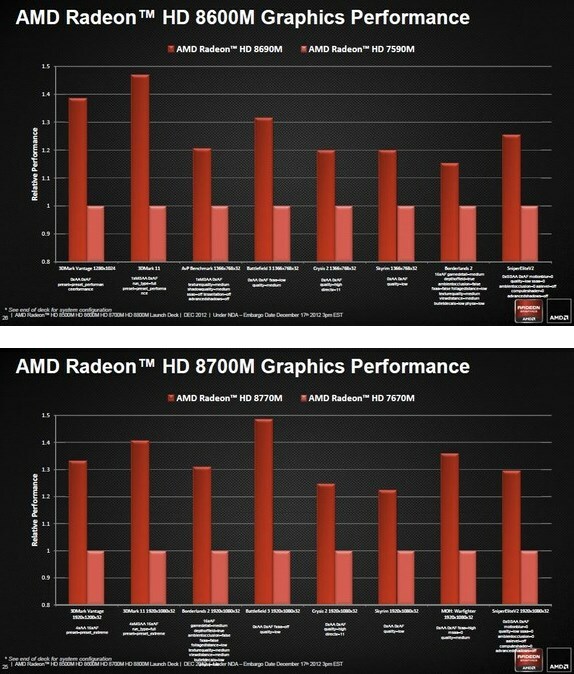 In these chart, AMD compares withe Radeon HD 8690M with the Radeon HD 7590M, and the Radeon HD 8770M versus the Radeon HD 7670M. On average, the firm seems to promise performance gains of 20-40%.